The West Antarctic Ice Sheet (WAIS) is more susceptible to marine influences than the East Antarctica Ice Sheet (EAIS). During recent decades, rapid changes have occurred in the WAIS sector, including flow velocity acceleration, retraction of ice streams, and mass loss. In this study, we use an ice core located near the Pine Island Glacier ice divide to reconstruct mineral dust and marine aerosol transport and the influence of climate variables on the elemental concentration. We have used extensive air temperature measurements (~  1400 station-years) to assess more than 10 gridded datasets over the Greenland ice sheet. We recommend the best datasets for estimating past melting of the ice sheet and show that choice of dataset is important for evaluating 31 earth system models. Most, but not all, of the datasets show similar history of temperature changes over the 20th century, and the earth system models generally capture long-term warming but not decadal variations. The regional climate model HIRHAM5 is evaluated over Vatnajökull, Iceland, using automatic weather stations and mass balance observations from 1995 to 2014. From this we asses whether the model can be used to reconstruct the mass balance of the glacier. We find that the simulated energy balance is underestimated overall, but it has been improved by using a new albedo scheme. The specific mass balance is reconstructed back to 1980, thus expanding on the observational records of the mass balance. The Toubkal is the highest massif in North Africa (4167 m). Landforms and deposits above 3000 m show the effects of frost action in the present-day geomorphological dynamics, but data on ground temperatures were lacking. In this study ground surface temperature data measured across an altitudinal transect are presented and analysed for the first time. The highlight is the possible occurrence of permafrost at an elevation of 3800 m, which may be of high ecological and hydrological significance. In this study we develop a framework to characterize directional changes in sea ice drift and associated deformation in response to atmospheric forcing. Lagrangian dispersion statistics applied to ice beacons deployed in a triangular configuration in the Beaufort Sea capture a shift in ice dynamical regimes and local differences in deformation. This framework contributes to diagnostic development relevant for ice hazard assessments and forecasting required by indigenous communities and industry. Stable water isotopes (δ18O) obtained from snow and ice samples from polar regions are used to reconstruct past climate variability. We present an experimental study on the effect on the snow isotopic composition by airflow through a snowpack in controlled laboratory conditions. The disequilibrium between snow and vapor isotopes changed the isotopic content of the snow. These measurements suggest that metamorphism and its history affect the snow isotopic composition. We analyzed Greenland Ice Sheet (GrIS) average summer surface reflectance and albedo (2001–2016). MODIS Collection 6 data show a decreased magnitude of change over time due to sensor calibration corrections. Spectral band maps provide insight into GrIS surface processes likely occurring. Correctly measuring albedo and surface reflectance changes over time is crucial to monitoring atmosphere–ice interactions and ice mass balance. The results are applicable to many long-term MODIS studies. We present medium and long-term measurements of precipitation in a coastal region of Antarctica. These measurements are among the first of their kind on the Antarctic continent and combine remote sensing with in situ observations. The benefits of this synergy are demonstrated and the lessons learned from this measurements, which are still ongoing, are very important for the creation of similar observatories elsewhere on the continent. Permafrost degradation in high mountain rock walls provokes destabilisation, constituting a threat for human activities. In the Mont Blanc massif, more than 700 rockfalls have been inventoried in recent years (2003, 2007–2015). Understanding permafrost evolution is thus crucial to sustain this densely populated area. This study investigates the changes in rock wall permafrost from 1850 to the recent period and possible optimistic or pessimistic evolutions during the 21st century. 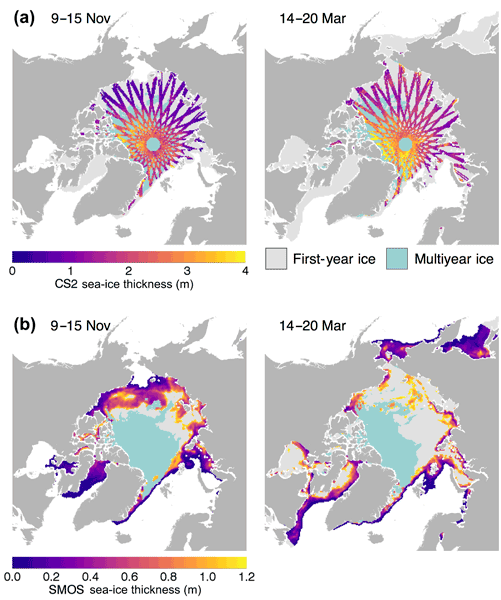 Sea ice drift has a strong impact on sea ice distribution on different temporal and spatial scales. An open-source sea ice drift algorithm for Sentinel-1 satellite imagery is introduced based on the combination of feature tracking and pattern matching. The algorithm is designed to utilise the respective advantages of the two approaches and allows drift calculation at user-defined locations. Snow depth over QTP plays a very important role in the climate and hydrological system, but there are uncertainties on the snow depth products derived from passive microwave remote sensing data. In this study, we evaluated the ability of passive microwave to detect snow cover and snow depth over QTP, presented the accuracy of passive microwave snow cover and snow depth products over QTP, and analyzed the possible reasons causing the uncertainties. Ice sheets reflect most incoming solar radiation back into space due to their high reflectivity (albedo). The albedo of ice sheets changes as a function of, for example, liquid water content and ageing of snow. In this study we have improved the description of albedo over the Greenland ice sheet in a global climate model. This is an important step, which also improves estimates of the annual ice mass gain or loss over the ice sheet using this global climate model. Information on the sea ice surface topography is valuable in geophysical investigations such as studies on atmosphere–sea ice interactions or sea ice mechanics. We investigated whether space-borne radar systems can be used to measure sea ice elevation. The answer is yes, but disturbing effects have to be considered, in particular sea ice drift and certain technical constraints. With future satellite radar missions, a fast wide-coverage acquisition of sea ice topography may be possible. We present a new method to estimate sea ice concentration in the Arctic Ocean using different brightness temperature observations from the Soil Moisture Ocean Salinity (SMOS) satellite. The method employs a maximum-likelihood estimator. Observations at L-band frequencies such as those from SMOS (i.e. 1.4 GHz) are advantageous to remote sensing of sea ice because the atmosphere is virtually transparent at that frequency and little affected by physical temperature changes.